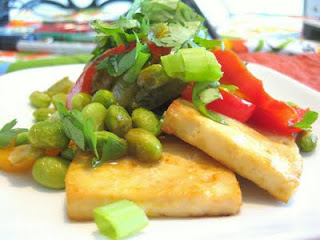 queen ketchup: orange-miso-glazed tofu and edamame. really yummy! I typed up the recipe and have left it as a comment. Recipe taken from Shape magazine. 1. Preheat broiler to high. Whisk together orange juice and miso in a small bowl and set aside. are tender. Season with salt and pepper, set aside. or until lightly browned. Flip tofu, brush with remaining miso mix, and broil for 1 to 2 minutes more. Spoon edamame and pepper mix on top, sprinkle with cilatro, and serve.